Serbia invites Azerbaijani businessmen to invest in a number of sectors of the country's economy. This was stated by Serbian President Aleksandar Vucic, who is on an official visit to Baku, at the Azerbaijani-Serbian business meeting on May 22. “Economic relations between our countries must be at the same high level as political ones. There are several factors stipulating that. Yesterday several agreements on strategic partnership were signed between Azerbaijan and Serbia. I hope that this will positively influence the development of bilateral relations between our countries,” the Serbian president said. There are also opportunities for the development of business relations, he added. “We invite Azerbaijani companies to invest in Serbia. We have a very favorable situation in the country for that. Our budget has been executed with a surplus for three years, thanks to which the population’s income is growing. In 2017, $2.6 billion of direct foreign investments were made in Serbia. In 2018 we expect their volume to increase to $3 billion,” Vucic noted. He added that Serbia is ready to provide Azerbaijani companies with various privileges, preferences and subsidies. “You can invest in any sphere in Serbia and depending on the amount of investments, we grant privileges in the amount of 15 to 20 percent. I call on Azerbaijani entrepreneurs to invest in real estate, hotel business, healthcare and other sectors. Investors will be provided with tax preferences and various subsidies,” the president said. Vucic also said that Serbia has invited the Azerbaijan Railways CJSC to participate in the modernization of the country's railway system. He added that Serbia will be glad to see competitive Azerbaijani companies in its market. “This work has so far been carried out for us by the Russian Railways. The railway network of Serbia needs to be repaired. If you are competitive, and as good as Azvirt (an Azerbaijani company that carried out a number of successful road projects in Serbia), you can come and take part in the repair of our railways,” Vucic said. Addressing the Azerbaijani-Serbian business meeting, Azerbaijani Economy Minister Shahin Mustafayev announced the date of the next meeting of the Azerbaijani-Serbian intergovernmental commission, saying that it will be held in September. 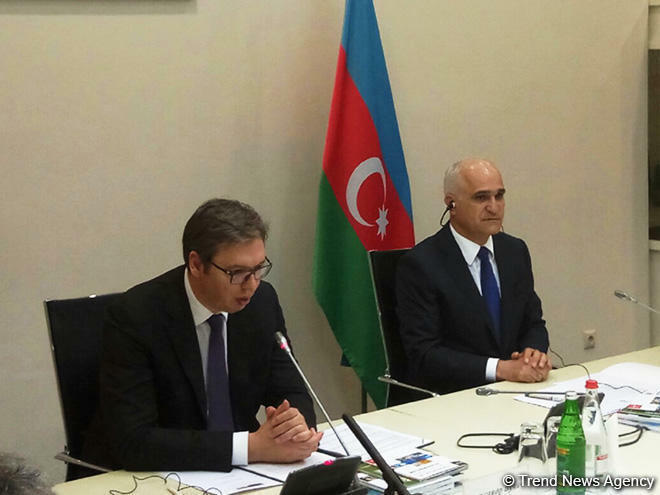 The fourth meeting of the Azerbaijani-Serbian intergovernmental commission on trade and economic cooperation was held in September 2015 in Baku. The regulatory framework between the two countries includes about 40 agreements. The main priorities of the trade and economic cooperation are projects in the construction, education, tourism and infrastructure spheres. Azerbaijan’s trade turnover with Serbia amounted to $1.96 million for the first four months of 2018, which is 30.7 percent more than in the same period last year, according to Azerbaijan’s State Customs Committee.